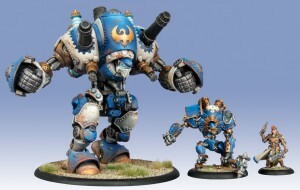 Warmachine is a fast-paced and aggressive 30mm tabletop miniatures battle game set in the steam-powered fantasy world of the Iron Kingdoms. The Quick Start rules offered below are designed to get you up and running with the contents of your battle group box set. They are streamlined to facilitate quick learning of the game’s fundamentals, and as such omit certain special rules and options. 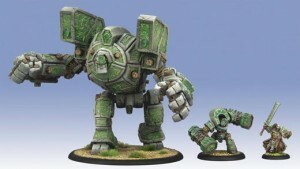 The Warmachine rulebooks Prime and Escalation provides greatly expanded rules that cover all the models, including troops and characters, as well as extensive background into the world of the Iron Kingdoms. Take control of a powerful warlock and wreck havoc on your foes with a warpack of hulking warbeasts fuelled by unbridled rage. In Hordes, only the strongest, fastest, and most cunning will survive, while the rest will be troll-chow for your warbeasts. Hordes is a new 30mm tabletop miniatures combat game set in the wilds of the Iron Kingdoms. Players jump into the action controlling enigmatic Warlocks and their packs of savage Warbeasts as they battle for territory and survival.